SEGA delivered plenty of Sonic Mania Plus news this week. The big announcement is the release date of July 17, and the first official trailer was shared online. Japanese magazine Famitsu also had its own coverage of Sonic Mania Plus this week. In a two-page feature, an interview was published with Sonic Team boss Takashi Iizuka. 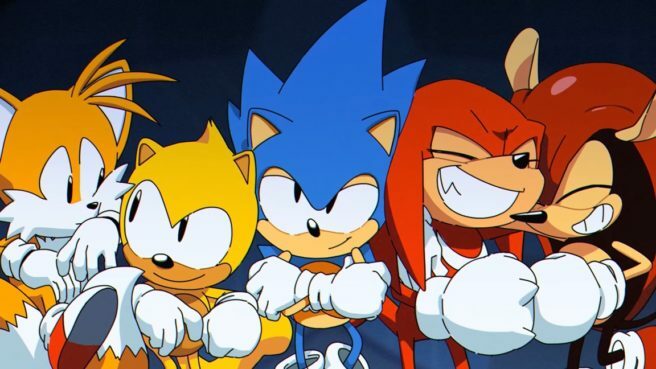 Iizuka was asked about how Sonic Mania Plus came to be, including Ray and Mighty, and more. You can read the full interview with Iizuka below. Famitsu: Please tell us the details on how you got to produce Sonic Mania Plus. Iizuka: Sonic Mania started as a digital-only title at first, but when we tried creating it, we received a lot of requests from both inside and outside the company to “release it physically as well,” so we decided to release it as our gratitude to everyone. However, since it would be difficult to sell the physical version with the same price as digital, we’ve prepared something as additional value to compensate the price hike, which turns out to be new characters and the Encore Mode. Famitsu: How did you decide on the additional features? Iizuka: Sonic Mania’s lifeline is giving stimulus to fans’ curiosities and expectations, so we thought of something that if added would make it the most exciting, and the results were Ray and Mighty. There were people requesting them, who appeared in the arcade version, to appear again. Personally to me, they were supposed to be “sealed characters” that would never be planned to be added to games. But in this title we are squeezing in all series materials aimed for specific manias, so the stage for them to appear has already been prepared. In that case, we should unlock that seal (laughs). Famitsu: How did you decide on the two’s unique actions? Iizuka: Mighty the Armadillo has a trait of being a strong guy, and he has a hard shell on his back. By making use of that, we made it into a technique to drop vertically to the ground and make it shake. Also, he can repel enemy bullets with the shell, and when he’s curled up he can prevent damage once. Doing a sudden drop to the ground is a rare action in the classic series indeed. Iizuka: Since he’s a flying squirrel, we instantly decided on a gliding action. Although it may be similar to Knuckles’ gliding, Ray can raise up with effort. Depending on the [player’s] technique, he can fly for very long. Famitsu: What kind of gameplay will Encore Mode have? Iizuka: The stages themselves are the same as Sonic Mania, but by re-arranging the objects and gimmicks, you can enjoy them with a different sensation. Besides, it also makes Mighty able to make use of his actions more. For example, we’re adding the ability to open holes in the ground with Mighty’s Hammer Drop. Famitsu: Finally, please leave a message to the fans. Iizuka: Thanks to everyone who bought the original Sonic Mania, we’re able to continue it to Plus, and we’re really grateful for that. There may be some impressions that Sonic Mania was aimed for people who knew of the Genesis-era games simply because it is a 2D game that feels like the past, but in actuality, people from a very broad age range are playing it. Especially outside Japan, the highest user demographics of digital downloads came from grade schoolers. This time we’re selling it in a form and price that’s easy to obtain, so to those who haven’t got to play this yet, please kindly get this. I can proudly recommend this title to Japanese grade schoolers as well. Nintendo Everything extends its thanks to BlackKite for this translation.